Dexter was picked up by his mom this morning, and I finally remembered to ask her why does he like to sit pretty? She said that he likes to sit pretty so he can get his belly rubbed. The mystery was finally solved. Sarris will be picked up this evening. She is one of the many dogs that I call, My Shadow, because she follows me everywhere. 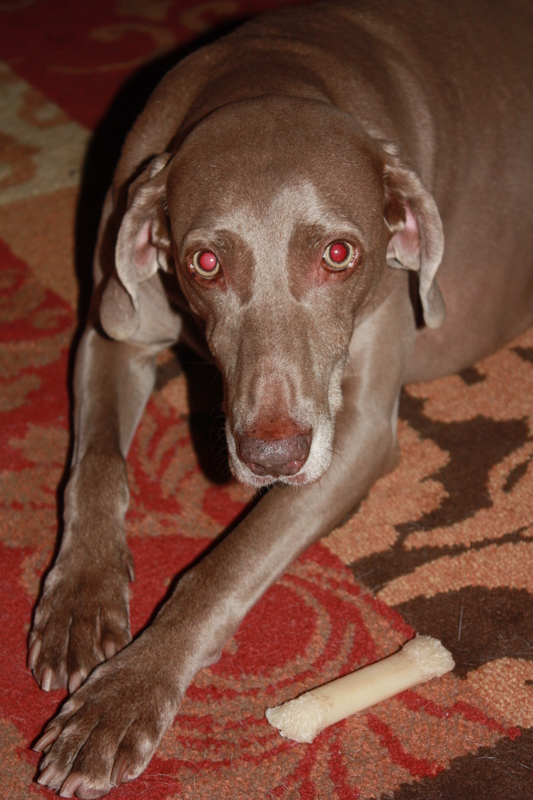 But on her defense, I’d like to point out that Weimaraners are called Velcro Dogs because they love to be close to their human so I don’t hold it against her. Actually, I find it funny because whenever I am doing chores she and my other shadow, Dexter, go up and down the stairs with me. That is why when is time to go to sleep they are pretty tired. Well, that and the walks/runs that they take with us during the day. By the end of today, Alex, again, will be an only child, but she does not seem to mind at all. Alex is the type of dog that can have other dogs living with her in peace, but can do just as well being the only canine kid. That’s why I always say that she is perfect for me. Enjoy your weekend. I am a firm believer that we can all do things in moderation rather than abstaining from them, and as such we find balance in life. Alex could sunbathe the entire day if I let her, and some pet parents have told me the same about their dogs, but letting dogs stay out in the sun for too long is dangerous, therefore I limit the time we are out on the deck to no more than 5 minutes in the morning during the Summer. Alex is always the first one to fall asleep. 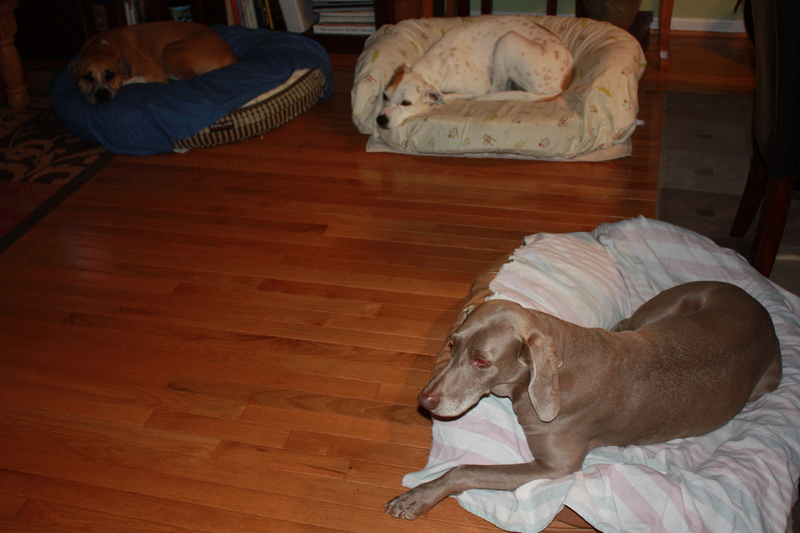 Sarris looks like she is about to follow Alex to dreamland, but Dexter, between you and me he thinks he is a guard dog, is still awake. 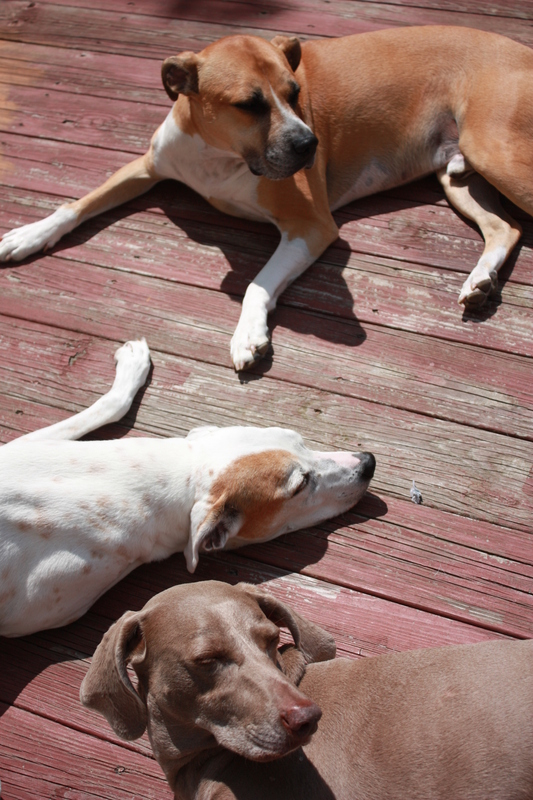 Alex and Dexter love to sunbathe while Sarris only prefers to do it for a couple of minutes. By the way, never leave your dog/s unattended anywhere and that includes your deck regardless of the time of day or season of the year. 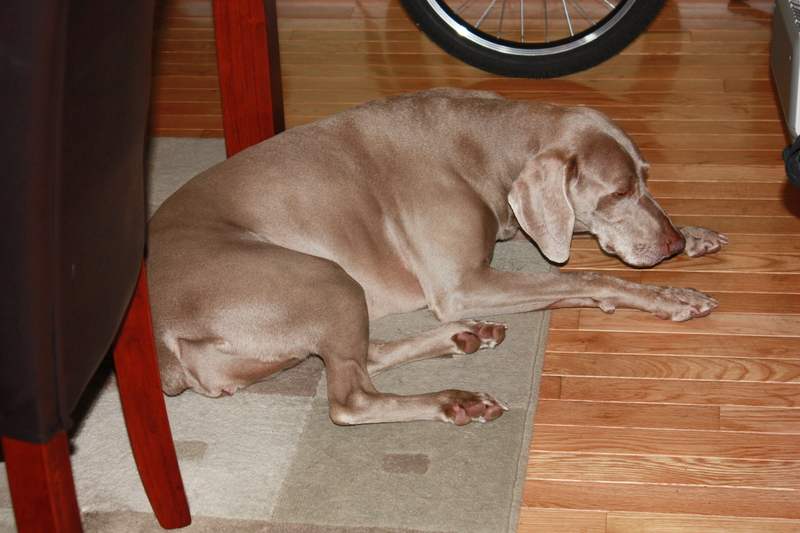 Right after we come in, Sarris relaxes in the kitchen on top of these cool tiles while Alex and Dexter go to their bed. There are times when all 3 of them end up in the kitchen and those are the times when I am so glad that my kitchen is not small. Because our morning routine takes a while, I always tell pet parents that if they call me or text me I will return their inquiries after I am finished with our morning routine. Let your canine companions enjoy being out sunbathing, but make sure that you are there to supervise and do it in moderation. Should I Run Or Walk My Dog? Well, that is a question that can only be answered once all factors are considered about the dog in question, therefore I’ll use Alex and her canine buddies as examples. Until early last year, I used to get Alex to run once or twice a week, but I stopped because the walks we take every day seem to be enough for her, and because a couple of months ago she started to limp while we were walking. I took her to the vet and she was given medication she has to take every day plus a lot of rest for a couple of weeks. Now she is back to her usual self, but she’ll go for a follow-up with the vet next week. What I do, since a lot of dogs have never run next to a bike, is get Alex to jog next to the bike I am riding for 1 minute or less. Why? 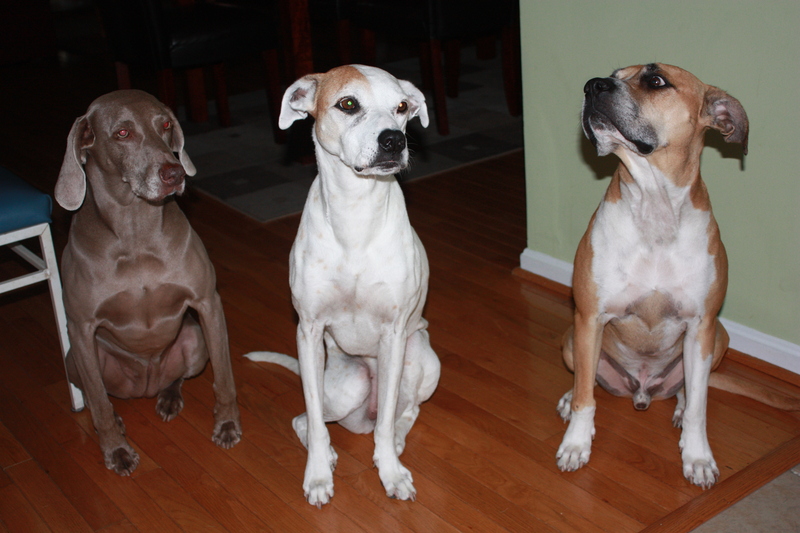 I want the other dogs to see what she is doing and mimic that behavior. Now, should Alex run or walk? She should walk because she is a senior dog and she was already limping while walking with me. 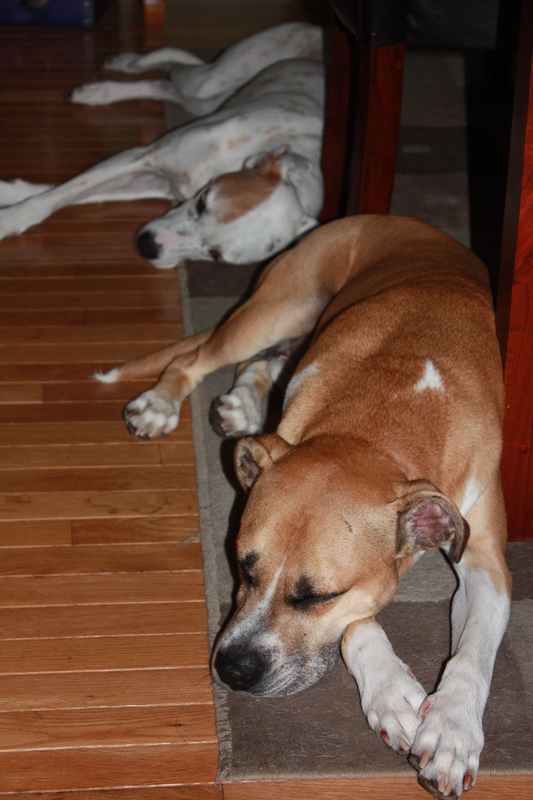 By the way, this is how Alex and Dexter looked on Saturday, after a good run early in the morning. 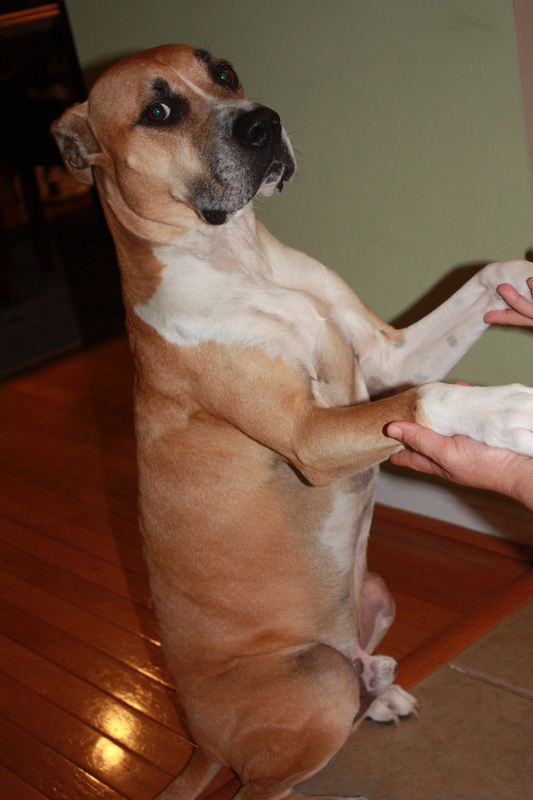 Sarris, unlike Alex, can run without a problem, but Sarris is also a younger dog. I got her to run/jog for about 10 minutes, and after that we walked home. She did not have a problem with the bike. Actually, she seemed to enjoy running alongside me. Should you run or walk Sarris? Well, I think she should run 2 to 3 times a week and walk the rest of the week because she is an active young dog. 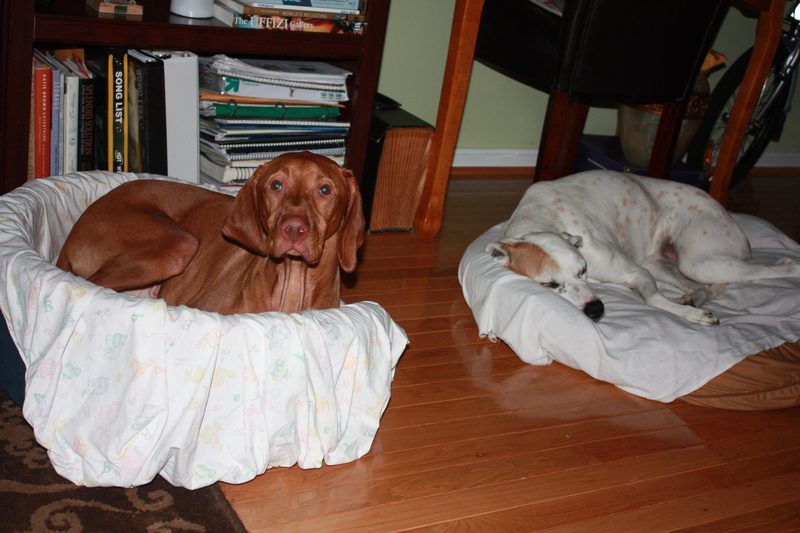 Of course, they need a comfortable bed to rest after exercising so here they are, L – R, Dexter, Alex, and Sarris. They were all ready for a nap. Dexter, the handsome boy all the way to the right, is about 2 1/2 years old and he is full of energy, therefore he can easily run every other day without a problem. His mom told me that he did not like bikes, so I was really surprised when after walking with him for 5 minutes he had no problem at all running alongside my bike. I was so happy and after a couple of minutes he tried to run fast, but I had to slow down because he is very strong and I did not want him to over do it. We kept up a pretty nice pace, but we did not go fast. Yes, Dexter should definitely run a few times a week. These are just a few suggestions to consider before taking your dog for a run. Remember that going for a run with your dog is supposed to be enjoyable and good for both, you and your dog. 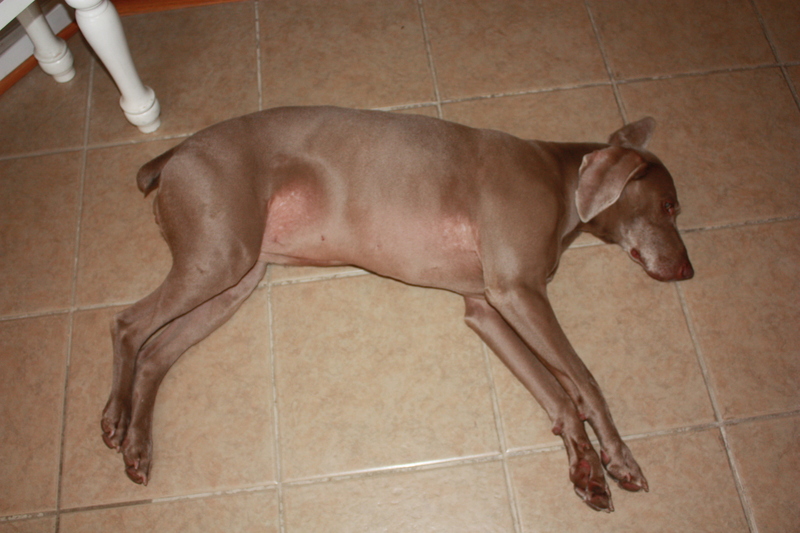 What do you do with your dog to help him burn some energy? 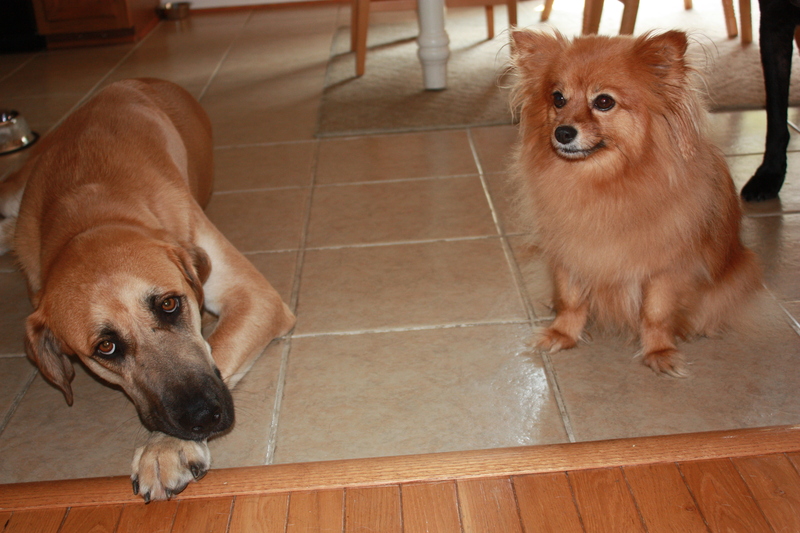 This week has been pretty busy and we’ve had 2 new furry companions: Bear and Bingo. 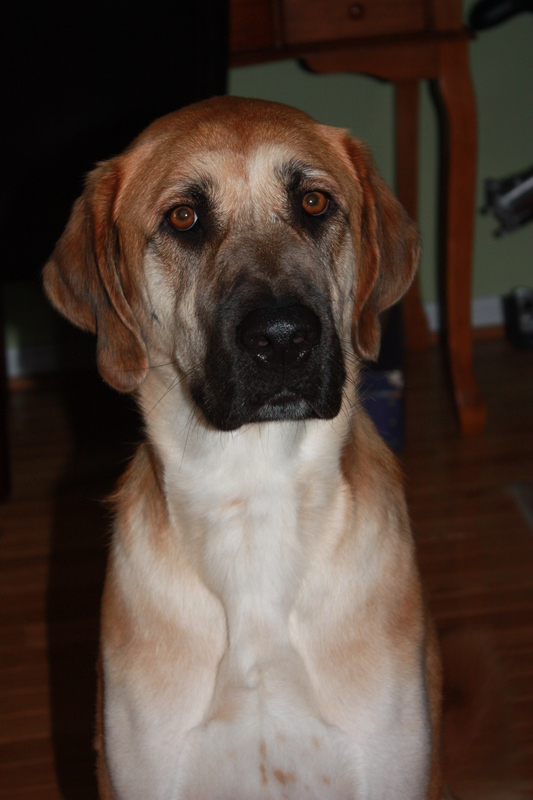 Our first one is this handsome 2 1/2-year-old boy, Bear. I think he might be the biggest dog we’ve taken care of so far. Because of his size, he is quite impressive, but he is very affectionate and playful. 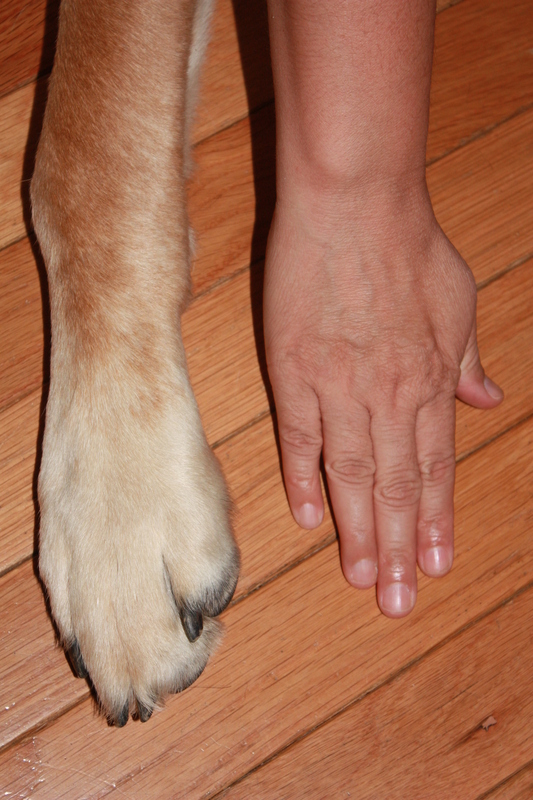 To give you an idea of how big Bear really is, I asked Cynthia to take a picture of his paw next to my hand. Could you believe the size of his paw? 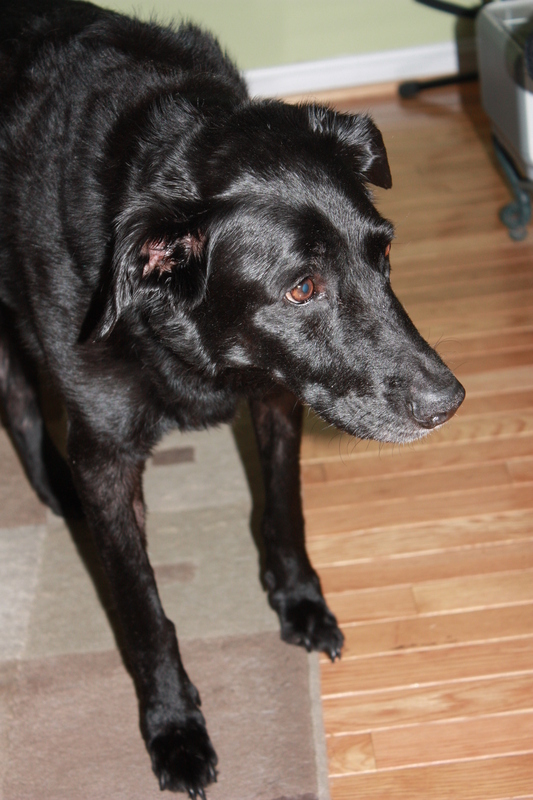 Our second new comer is a cute 14 year old lab named Bingo. He is not playful, but he is an amazing dog. He reminds me of my Alex a lot, therefore I’d have to say that my opinion is one that is not truly fair but rather biased. Bear with a frequent visitor, Roxy. She usually likes small male dogs, but for some odd reason she warmed up to Bear pretty fast. Cute couple. Even though this was a pretty busy week, I enjoyed it because I got to see how much dogs differ from one another, and I got to spend time with them. 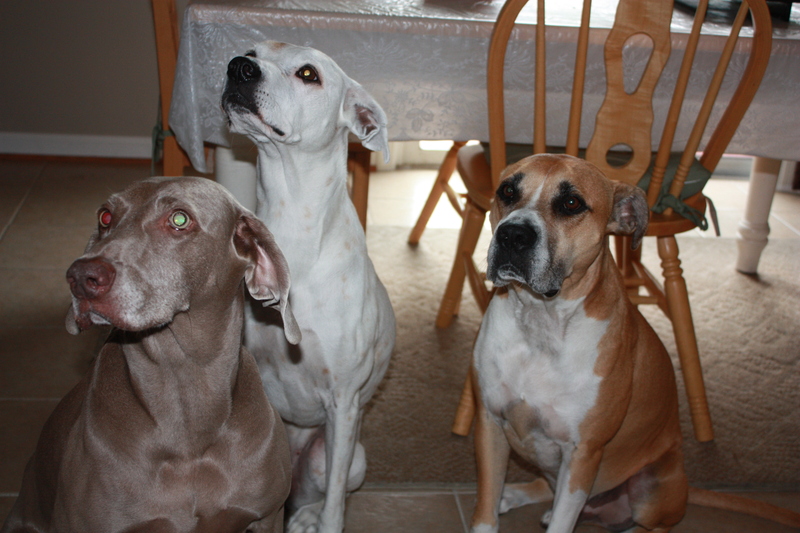 I’d like to call them my peeps, but that is for humans. What word could I use to call them my peeps? What would you suggest? I took this picture while Dieter and Alex were asleep, but the flash woke up Dieter. Alex is so used to it that she can sleep right through it. This 4th of July was uneventful and enjoyable. 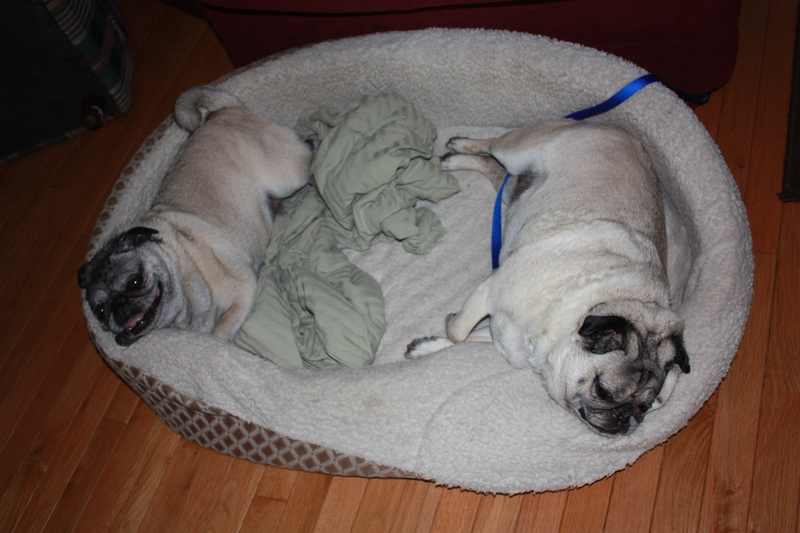 Uneventful because nothing out of the ordinary happened, and enjoyable because even though we were able to hear the fireworks from Ft. Meade, Alex and Dieter only barked once and after that they went to their beds to sleep. Bella and Milo, from left to right, were not as cooperative for this photo shoot as Dieter and Alex were, therefore I had to put a collar and leash on Milo. 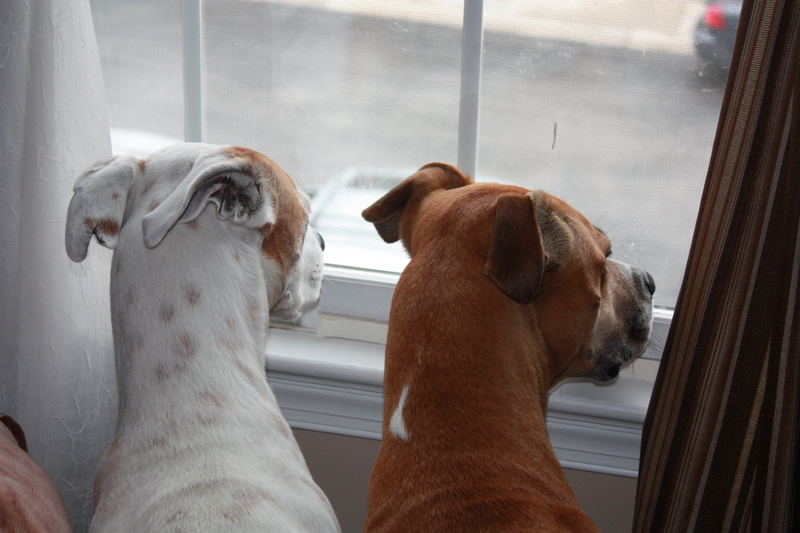 Because the temperature will be pretty high this weekend, we’ll take Bella and Milo for some mini-walks rather than 2 long walks. 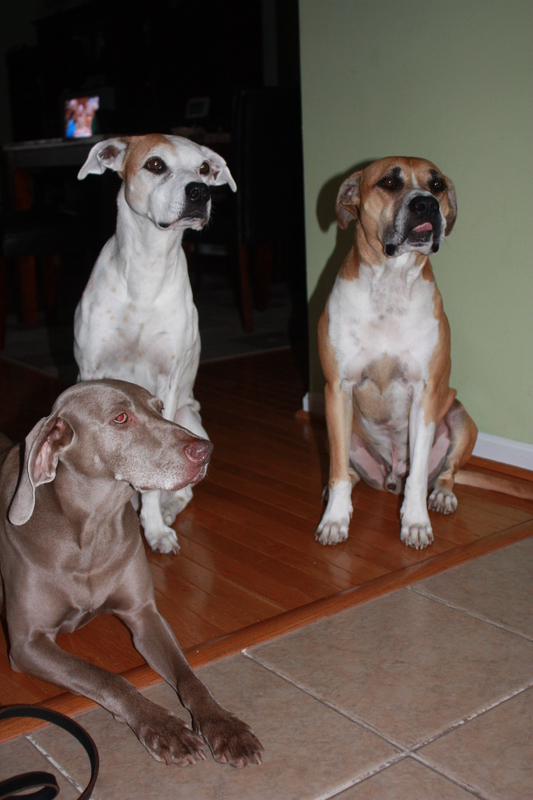 Make sure that you adjust your walks based on your dog’s age, activity level, weight, and of course, weather. Happy 4th of July weekend to all pet parents and their canine companions. 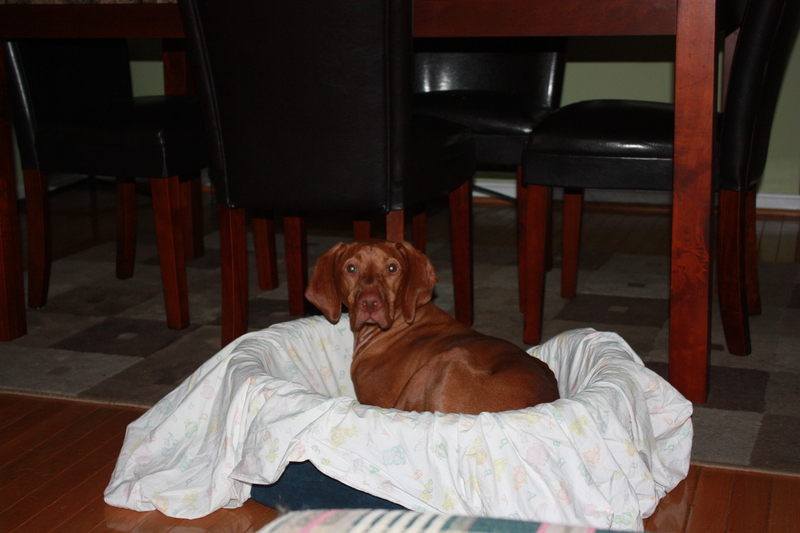 This is Dieter, a 2 1/2 year old Vizsla. 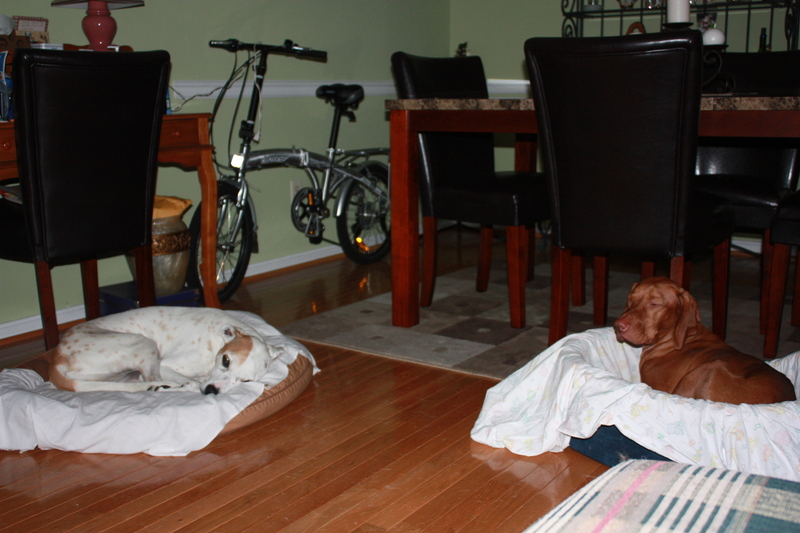 When he is in his bed, he looks smaller than Alex. He was asleep, but woke up when he saw the flash. I know, I know, I should have let him sleep, but he is too cute not to photograph. Alex is so used to us taking pictures that not even the flash of the camera faces her anymore. 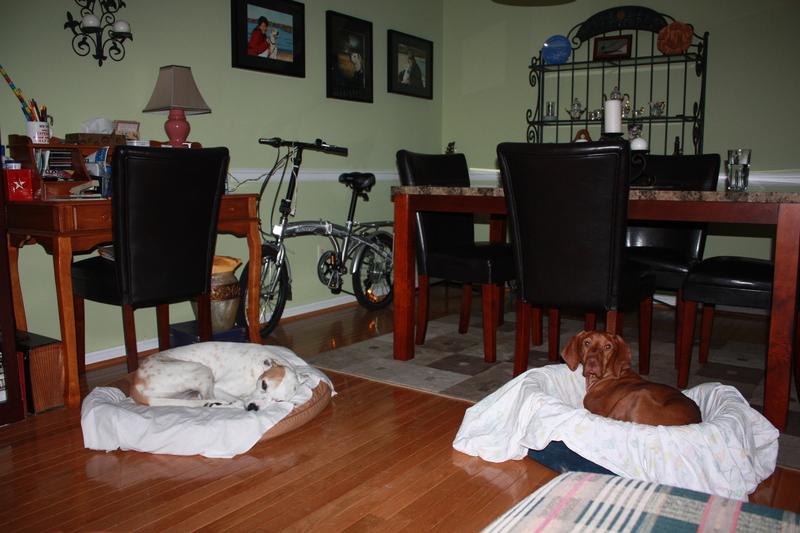 This is what they look like after our morning walk, relaxed and a little tired. I guess Dieter lost interest in the flash from the camera so he is about to fall asleep. In a couple of minutes, breakfast time. 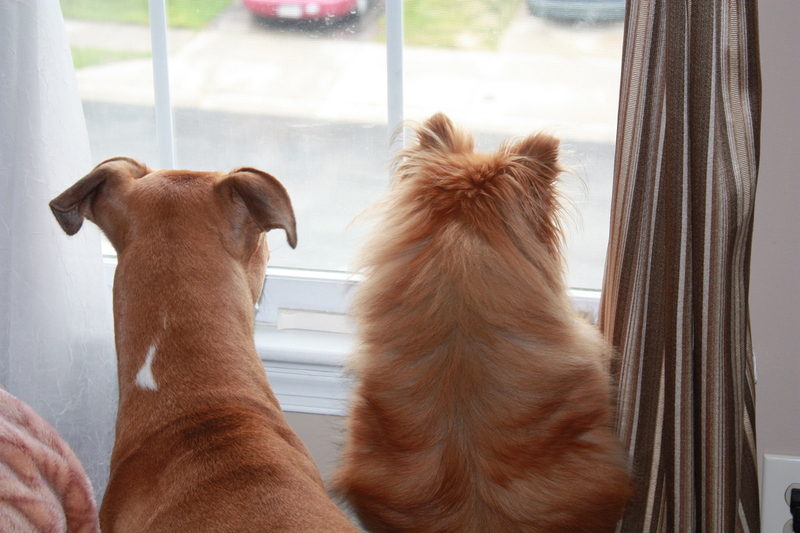 Alex and Dexter, from left to right, are watching what our neighbors are doing so they can later on share some gossip with us. I don’t know who’s turn is it to take notes so nothing goes unreported, but I am sure they’ll do a great job.